Pierre Poret is Director of the Directorate for Financial and Enterprise Affairs of the OECD. DAF supports governments to improve the domestic and global policies that affect business and markets. Key areas of work include anti corruption, corporate governance, competition, financial markets, international investment, insurance and private pensions. 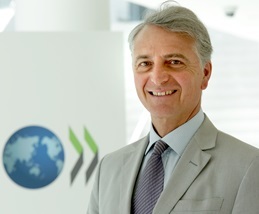 From June 2014 to September 2016, Mr. Poret was Deputy Director in this Directorate and also the Directorate’s Coordinator for OECD Accession and the Chair of its Editorial Board. Mr. Poret was appointed Counsellor of the Director in the Directorate in 2011. From 2001 to 2010, he was Head of the Investment Division where he managed a team of 30 policy analysts, responsible for advising governments on international investment policies, corporate responsibility, international investment agreements and investment statistics standards. From 1998 to 2001 Mr. Poret held several positions at the OECD including Deputy Head of the Secretary-General’s Office. In 1986 he joined the OECD as an Economist in the Economics Department, becoming a Senior Economist in the Directorate for Financial, Fiscal and Enterprise Affairs in 1991. In this role he was in charge of the accession of new members to OECD legal investment instruments and of the financial aspects of the 1995-98 Multilateral Agreement on Investment hosted at the OECD. Mr. Poret is a French national. After graduating with a Doctorate in Business Management from Paris IX – University in 1982 and obtaining an “Agrégation” in Social Sciences in 1983, Mr. Poret worked as a macroeconomist at the French Ministry of Finance (1983–1986). Mr. Poret has published on many subjects, including capital flow management, financial services, international agreements, private-sector productivity, economies in transition, wage and price modelling, economies’ resilience.